Jack Butler Yeats was six years younger than his brother William, and probably didn’t see much of him growing up, because when the family moved rather suddenly to London when he was six or seven, they left him with his grandmother in Sligo for the next eleven years. Apparently, it was a better place for a little boy to grow up. It doesn’t seem to have harmed young Jack, who loved Sligo and painted it until the very end of his life. He came by his artistic talent naturally; his father had abandoned a career in the law to become a portrait painter–this was perhaps the one rare family in which deciding to become a poet probably sounded perfectly reasonable. After returning to Ireland in 1910, he devoted himself primarily to painting, and was inspired by the landscapes of Sligo throughout his life. The painting below, titled Returning from the Bathe, shows the seacoast near where he grew up. For more on Jack Yeats, see the National Gallery website, and this nice essay by Colm Tóibín in The Guardian. Over the years at family dinners I’d heard snippets of anecdotes about our Welsh roots from my grandmother, Mary Jean (Smith) Madigan. The information I learned was intriguing, but I never really had paid much attention to figuring out littler details like who married who, and who came from exactly what city, and so on. Now, since I’m going to be engaging with Welsh poetry so closely, I suddenly became entirely compelled to have a straightforward conversation with my grandmother about our Celtic lineage. My Welsh great-great-grandmother, Mary Ann (nee Rees) Smith was born on March 6 1881, in Pontypridd, which was then County Glamorgan. Pontypridd was known for its coal mining within the Rhonda River Valley, located north of a town called Cardiff. Mary Ann had two sisters, Sarah and Blodwyn, and a brother, Gordon. Their family emigrated to Nanticoke, Pennsylvania, around 1890. This was where Mary Ann Rees married my great-great-grandfather, Robert Murray Smith, with whom she had 13 children. This is the “Old Bridge” of Pontypridd. Robert Murray Smith was born in 1871 in Cleator Moore near Penrith, in the North of England, which was a center for iron mining south of the Lake Country and Scottish border of Glasgow. (His mother, Isabelle Campbell, was Scottish.) The Smiths emigrated to Nanticoke in the late 1880s. My grandmother grew up in Nanticoke among a large Welsh population in the mining towns close by. She sang in a Methodist church junior choir and remembers how the church’s Welsh director took the choir to sing in the Welsh Eisteddfod, a song and music competition, at the Edwardsville, PA, church. YouTube has tons more of Eisteddfod samples, should you want to explore more. Enjoy! Some people, on seeing this “January 25: Robbie Burns Day. You should drink whiskey and eat haggis tonight” on the syllabus, must wondered what Robbie Burns day was. 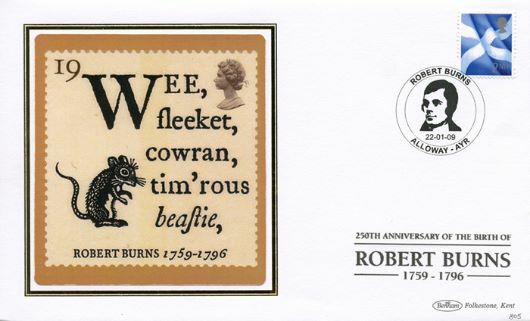 Who was Robbie Burns? Why did he have a holiday? And why, why, would you eat haggis and drink whiskey on this day? So in response, I’m writing this blog post to explain. The website www.robertburns.org Robert Burns is a famous Scottish famer-turned- poet, born on January 25, 1759 in Alloway in County Ayr, Southwest Scotland to a simple tenant farmer (Which, if you are interested in military history, is two months, nine days, and thirteen years since Bonnie Prince Charlie’s Jacobite forces were defeated at the Battle of Culloden, ending his attempt to reclaim the throne of Scotland). The house Burns was born in is a historic landmark today. Burns has quite the rags-to-riches story. He spent most of his childhood and young adult in poverty, moving from failing farmstead to failing farmstead, but by the age of twenty-seven his poetry was well-known in the fashionable circles of Edinburgh, and by the time he died in 1796 he had made a place for himself in Scottish History and Culture as the Scottish Bard. His poetry was particularly interesting for its unabashed use of the Scots dialect. Some of his best known poems are “Tam O’Shanter”, the tale of a rather drunk man who finds himself an unfortunate witness to a fairy dance and must ride for the safety afforded by the river (the poem can even be found engraved on a chair in Holyrood House in Edinburgh) “To a Mouse”, “To a Haggis”, “Holy Willie’s Prayer” and one of Scotland’s famous patriotic ballads, “Blind Harry” (the tale of William Wallace, of Braveheart fame). Today, people all over Scotland celebrate Rabbie Burns day as an act of nationalistic pride. The event starts with the organizer welcoming his guests to the feast and explaining the purpose. The Scottish Selkirk grace is then read, and the meal begins with soup. Nest, the Haggis enters. The entrance of the Haggis to the celebration is traditionally prefaced by a reading of the poem “To a Haggis”, the poem in which Burns professes Haggis to be the “chieftain of the pudding race” (line 2) and a bagpiper playing in an event known as the “Piping of the Haggis”. The reader of the poem then has the honour of cutting the haggis for the assembled company. A toast is then made to the haggis and dinner continued. *This second image is a haggis up close. It’s delicious, despite how it looks. So, I encourage you to go forth and celebrate! I know this post comes late, but there’s never a bad time to celebrate the works of a great national poet! I also recommend Robert Burns, a Very Peculiar History by Fiona McDonald, and am willing to lend my copy to anyone who is interested! As a child, Yeats spent his summer holidays in beautiful (if damp!) County Sligo, in the West of Ireland. It was there that he met Eva Gore-Booth and Constance Markiewicz (née Gore-Booth); “In Memory of Eva Gore-Booth and Con Markiewicz”, a late poem, is a lament for lost beauty and lost innocence. The sisters lived at Lissadell House, which still stands, although it has recently been the subject of extended (and fairly incomprehensible) legal disputes. Yeats himself returned to Sligo upon his marriage, buying a very different sort of house, Thoor Ballylee, a Norman tower which inspired “The Tower.” It doesn’t look like a comfortable place to live, but I have visited it, and it is surprisingly snug inside. Yeats is buried in Sligo, in Drumcliffe Churchyard, “under Ben Bulben” as he had requested. A “ben” (or a “pin” in some parts of the country, is a mountain, or what passes for a mountain in Ireland. The inscription on Yeats’ gravestone consists of the last few lines of his last poem, “Under Ben Bulben.” My favorite English teacher in college used to claim that when first he visited Yeats’ grave, a single black crow feather fell softly down from the sky to lie upon it; he kept it as a page marker in his collected Yeats. I’m not entirely sure that story is true (he was a great teller of tales!) but I certainly hope so. Please think of this blog as a space where you can muse about whatever you like… tomorrow’s readings, haggis, the difficulty of deciphering Welsh pronounciation, your favorite band with some claim to being Celtic. If you are desperate for a prompt, email me and I’ll send you one, but these may be idiosyncratic at best! Add pictures, media files, whatever you like.